Gary Cooper, whose real name was Frank Cooper, was born in Helena, Montana, on May 7, 1901 and died in 1961. In his early silent days he was dreamy and handsome. In the 1930's, as he matured, he became a manly hero, shy and soft spoken, radiating sincerity and honesty. He was born to British parents and was educated in Britain in the years leading up to World War I. Back home in Montana, he worked as a ranch hand and then joined his family in Los Angeles, where he put his horse riding skills to good use as an extra in dozens of Westerns. His agent persuaded him to change his name to "Gary", (after her hometown in Indiana) and secured him a bit part in a Ronald Coleman film called "The Winning of Barbara Worth" in 1926. When the second lead failed to turn up, Cooper took over, he died in Coleman's arms, and caught the attention of the critics. He was signed by Paramount and given a small part in "It" (1927), with Clara Bow. He had a passionate affair with Clara and at her insistance, he was given a role in "Children of Divorce" and then starred in "Wings" both in 1927. His first all-talkie was "The Virginian" in 1929. John Barrymore, whose real name is John Blythe, was born in Philadelpha, Pennsylvania, on February 15, 1882 and died in 1942. He was the youngest member of the famous theatrical Barrymore family who was bored with the stage and came out to Hollywood to stay in 1924. His memory was already failing because of his drinking and he had that ever-present need for money. He had made a few unsucessful films with the exception of "Dr. Jekyll and Mr. Hyde" in 1920. On the strength of "Beau Brummel" in 1924, Warners signed him at a fee of $76,250 per picture. In 1926, "Don Juan" was the first feature to be released with a synchronized musical score, with his beautiful voice, proved to be no problem for him as it was for some silent stars with the coming of sound. He was successful for a while. After a few failed pictures Warners let him go and for some time he joined his brother Lionel at MGM. Over the next three years, he gave his finest performances. Charlie Chaplin was born in London, on April 16, 1889 and died in 1977. His childhood was like a nightmare. A drunken father, and a mother who spent long periods in lunatic asylums, sending Charlie to an orphanage. His stage career began at the age of 7, in a dancing troupe. He toured America twice while in a vaudeville act. His first break came in the silent film "Kid Auto Races At Venice" in 1914. By his twelfth film, "Caught In The Rain", also in 1914, he was directing himself. He was billed as "The World's Greatest Comedian", and started making $1,250 a week. After making "The Tramp" in 1915, he was making $10,000 a week, plus a $150,000 bonus and made 12 films between May 1916 and October 1917. Buster Keaton, whose real name was Joseph Keaton, was born in Piqua, Kansas, on October 4, 1895, and died 1966. He began performing as a toddler in his parents' vaudeville act. Billed as 'The Human Mop', he acquired the deadpan quality and matchless physical elasticity which he perfected in his great years. He made his film debut at Fatty Arbuckle's Comicque studios, in "The Butcher Boy" in 1917. Between 1919 and 1923, he directed and starred in "One Week" in 1920 and "The Boat" in 1921, to name a few. 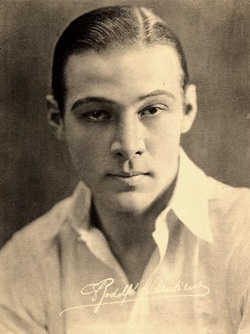 Rudolph Valentino, whose real name was Rodolfo Guglieimi, was born in Castellaneta, Italy, on May 6, 1895 and died in 1926. He was born of peasant stock, the son of a veterinary surgeon. He arrived in America in 1913, and after working as a gardner in Central Park, became a dancer in a New York nightclub. In this shadowy world he gave sexual favors on both sides of the fence. and was involved in petty crime and blackmail. He made his way to San Francisco with a touring troupe and then travelled to Los Angeles. Mae Murray, an old friend found him work in "Alimony" in 1918, and Universal gave him leads in "A Society Sensation" and "All Night", also in 1918 and in "A Delicious Little Devil" in 1919, before he was started as gangsters and heavies. 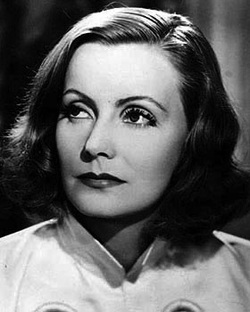 Greta Garbo, whose real name was Greta Gustafsson, was born in Stockholm, on September 18, 1905 and died in 1990. She had a poverty-stricken upbringing. In the early 1920's, director Mauritz Stiller dreamt of creating a new kind of woman, sophisticated, scornful, and superior, but beneath the glittering surface, he wanted her to be warm and vulnerable. He had already chosen the name 'Garbo", when he spotted his protégeé amongst a bunch of extras and cast her as the second lead in "The Atonement of Gosta Berling" in 1924. In 1925, he accompanied her to Hollywood and MGM, although unimpressed by her, cast her in "The Temptress" and "The Torrent" in 1927. Her last silent film was "The Kiss" in 1929. A lot of care was taken over her introduction to sound. Claudette Colbert, whose real name was Claudette Chauchoin, born in Paris, on September 13, 1905 and died in 1996. Her parents came to America when she was six, and she made her stage debut in 'The Wild Westcotts' in 1923. By the late 1920's, she was a leading Broadway actress with one silent film to her credit, "For the Love of Mike" in 1927. 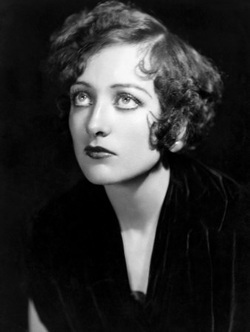 The coming of sound and her stage background, secured her a contract with Paramount, for whom her first film was "The Hole in the Wall" in 1929. In 1934, she was loaned to Columbia to play the runaway heiress in Frank Capra's "It Happened One Night". She stayed at the top for the next 10 years and in 1938 was listed as the highest paid Hollywood star at a salary of $426,944 a year. Joan Crawford, whose real name was Lucille Le Sueur, was born in San Antonio, Texas on March 23, 1904, and died in 1977. She started as a dancer and was spotted in the chorus line of a Broadway musical by an MGM producer. Placed under contract, she made her screen debut doubling for Norma Shearer in "Lady of the Night" in 1925. As Lucille Le Sueur, she appeard with Jackie Coogan in "Old Clothes" in 1925 and then MGM launched a publicity campaign to find her a new name. Transformed into Joan Crawford, she dieted ferociously to give her face the angularity which became the foundation of her enduring stardom. 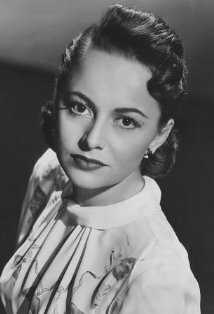 Olivia de Havilland was born in Tokyo, in 1916. She was the elder sister of Joan Fontaine, born of British parents, who separated when she was six. She was brought up by her mother in California and while still a student, was chosen to play Hermia in the Hollywood Bowl production of 'A Midsummer Night's Dream' and in the subsequent Warner Bros. film, which the studio had signed her to a seven year contract and her first film was "Alibi Ike" in 1935. She starred with Errol Flynn in a series of classic swashbucklers and action movies, including "Captain Blood" in 1935, and "The Adventures of Robin Hood" in 1938, as the most captivating of Maid Marions. Katharine Hepburn was born in Hartford, Connecticut on November 9, 1907 and died in 2003. From her first appearance on the screen co-starring opposite John Barrymore in "A Bill of Divorcement" in 1932, it was clear that a new star had arrived in Hollywood. She burst onto the screen like a breath of fresh air. Tall and slim, with high cheekbones, clean-cut features and aristocratic bearing, she was not conventionally attractive, but more than made up for it through her talent as an actress, and her personal distinctive style. Her first film, along with "Morning Glory" and "Little Women" both made in 1933, as well as "Alice Adams" in 1935 were all box office hits.